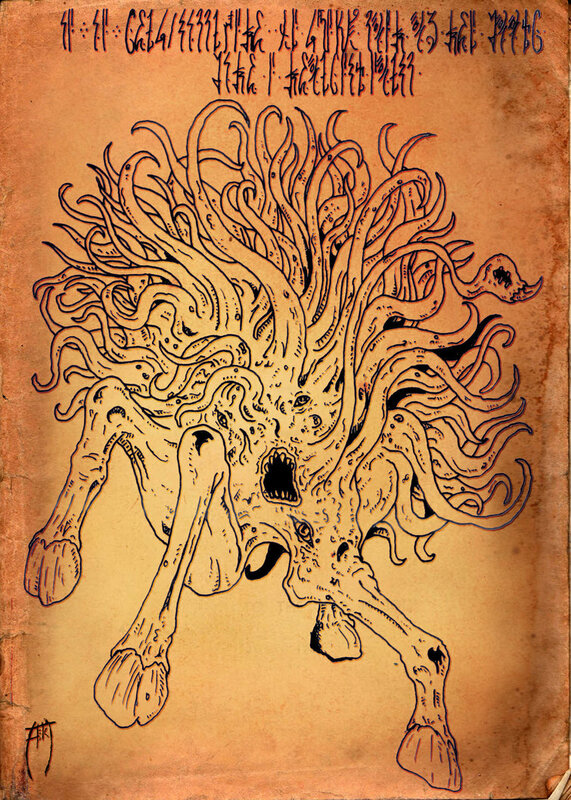 Frequently, Shub-Niggurath is described as the Black Goat of the Woods with a Thousand Young. This reference to her thousand young and her association with sexual reproduction has historically made her somewhat easier to understand relative to some of the other extra-dimensional Lovecraftian beings. Indeed her association with successful birth and increased fecundity must make her an attractive entity or god to worship for humans and other species within and even out of our space-time. Obviously, having healthy children and no mortality of the mother during childbirth would be something that primitive humans would pray for and desire. In addition, increased fecundity associated with crops and livestock was also a desired outcome and could mean the difference between life and death in both temperate (harsh winters) and equatorial (dry seasons) regions of the planet. Indeed for primitive humans the representation of the goat may not have any association with Satan or devils but more of a symbol of the successful reproduction of both the community and their agricultural resources. 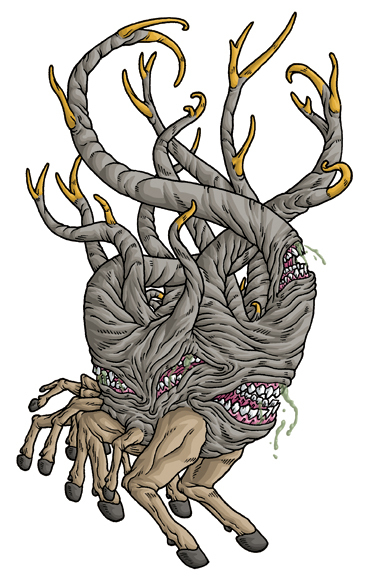 Therefore, of all of the strange, extra-dimensional entities, the one that would be most attractive, filtering into the minds of humanity and other species is Shub-Niggurath. So what does Shub-Niggurath get out of being worshipped by these strange, fragile bags of cells and tissues, confined to three spatial dimensions and one temporal dimension? I hypothesize that the relationship between Shub-Niggurath and humanity, and possibly other species, is a form of commensalism. There are a variety of ecological relationships among organisms (e.g. predation, competition) and commensalism is one where one organism benefits from the relationship but the other receives no benefit but is not negatively impacted as in predation or parasitism. One of the most commonly referenced examples of commensalism is between clown fish and sea anemones. While the clown fish lives among the sea anemone’s tentacles for refuge and protection against predators, the anemone itself does not appear to receive any advantage or benefit with this relationship. Another example of commensalism I am more familiar in my line of work is the case where hair fungi (trichomycetes) grow attached to freshwater cladocerans such as Daphnia. 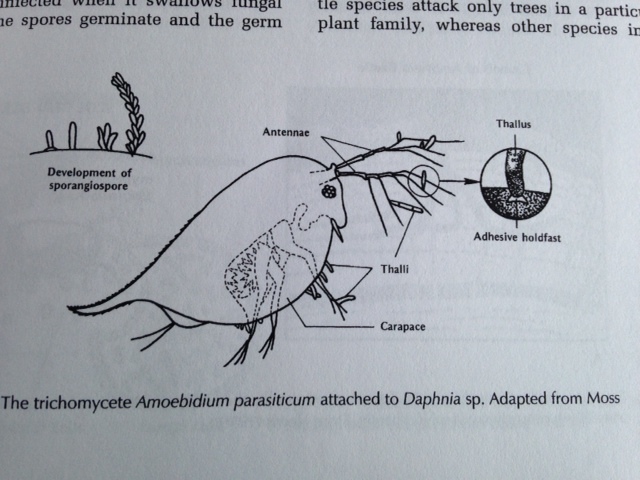 The fungi get a substrate to attach to and increased availability of nutrients / organic material as the Daphnia feed on algal and bacterial cells (Symbiosis: An Introduction to Biological Associations, 2nd edition by Surindar Paracer and Vernon Ahmadjian, 2000). In contrast, there is not measured benefit or disadvantage with Daphnia being “infected” with the hair fungi. I propose that a similar commensalism relationship exists between Shub-Niggurath and humanity. The benefit to Shub-Niggurath from this relationship is to receive infusions of DNA or other biological materials (e.g. proteins, cells, tissues) from the residents of our space-time. Ancient cult sacrifices are frequently associated with worshipping Shub-Niggurath, which involve blood sacrifices of animals and sometimes even humans. I hypothesize that such sacrifices provide Shub-Niggurath with the biological material from our space-time to either phase into our reality or, more than likely, produce progeny who can survive, thrive and reproduce in our space-time. This I believe is the origin of her Thousand Young, also known as the Dark Young. As proposed above, the outcome of this “infusion” of biological material from our space-time into Shub-Niggurath is the development of the Dark Young. It should be noted that while HPL used the term “black goat of a thousand young,” he did not refer to them as Dark Young. Based on The Encyclopedia Cthulhiana, 2nd edition (Daniel Harms, 1998), Peterson and Willis were the first to describe the Dark Young as the spawn of Shub-Niggurath (Call of Cthulhu Rulebook, 5th edition, 1992), although these entities were also described by Robert Bloch in the tale “Notebook Found in a Deserted House” (first published in Weird Tales in 1951). The Dark Young are described as having large black bodies with a series of thick, ropey tentacles coming off the top of their bodies with hoofed feet and large mouths filled with sharp teeth in their mid-section (see below). More than likely the Dark Young are members of the Thousand Young but more than likely they are not the only representation (or species?) of the thousand young. While they appear to be true manifestations of matter, created within our space-time, they are clearly extra-terrestrial and more than likely also extra-dimensional entities. Thus, in a sense, they may be similar to the Whateley twins in :The Dunwich Horror.” That is, they are extra-dimensional hybrids. This is the benefit Shub-Niggurath receives by being worshiped by human cultists (and possibly other species). The biological material is used to produce her Dark Young who in turn are provided with the opportunity to manifest and successfully breed in our universe. To date, the Dark Young have not been successfully established, at least in our corner of the universe. 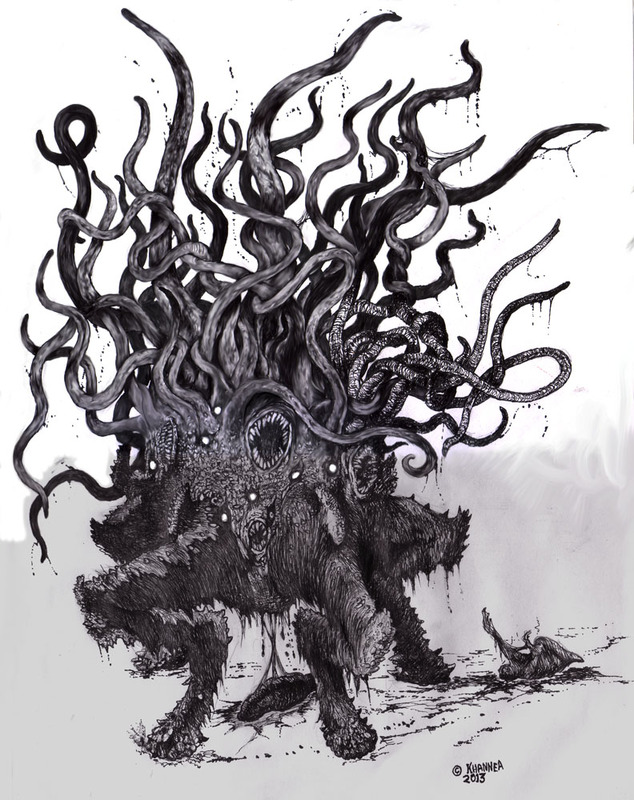 To conclude, while Shub-Niggurath may be thought of as the “mother” of matter in our universe, she is still trying to reproduce and seed our universe with her direct lineage. However, as with Cthulhu and Yog-Sothoth, since she is from outside of our space-time she has a difficult time manifesting herself in our universe in a stable form for extended periods of time. Thus, while Cthulhu’s means of entering our universe is based on influencing the dreams of lower entities to opening the way, Shub-Niggurath focuses more on seeding our universe with her thousand young. To do this she needs to use our biological resources. However, what do humans receive from Shub-Niggurath? I propose nothing. While she may influence their dreams and stimulate their imagination to unconsciously persuade them to worship her and thus provide sacrifices, there is no evidence to suggest that the cultists are provided with provides any benefit (evolutionarily or otherwise). This is why I hypothesize that this relationship is more a form of commensalism and less of a form of symbiosis. In fact, her influence on entities in our space-time, to obtain the biological resources may be a form of “extra-dimensional biological instinct” on her part. Thus, these actions may possibly be part of a large, grand life cycle that may run over the course of billions of years. 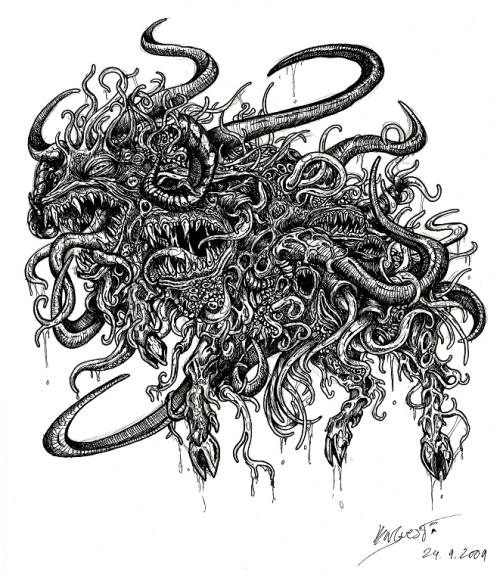 Next time we will talk about Shub-Niggurath and Yog-Sothoth’s offspring – Nug and Yeb. Finally I do want to remind you that if you enjoy Lovecraftian Science and would like more, then please check out my Kickstarter at https://www.kickstarter.com/projects/1081353216/lovecraftian-science-volume-1. It will be a 100 page periodical with over 20 original illustrations by Steve Maschuck. Thank you – Fred. This is some absolutely outstanding work. I’ll punt you a few quid for your project I reckon. A relatively new reader here – I find your blog very much to my liking. I’ve been trying to think of the Mythos in semi-scientific terms ever since I’ve started developing a Cthulhupunk campaign for GURPS, and several of your observations and conclusions coincide with my own. Reading of Shub-Niggurath now I really like how you’ve tied basic cosmic phenomena with the Old Ones, and go in the direction that they themselves are sources of things like dark matter/energy, normal matter, etc. I have started from a slightly different premise, that it’s the universe itself which has a prerogative (where it comes from I do not know) that life must appear, which results in races living in most unfavorable places (such as ghouls living in the underground tunnels of a planet orbiting a red dwarf), and beings that seem to epitomize some concepts. For example, Yog-Sothot (which may have started as a singular being, or a congolmerate of transended races fused together, just a random idea) entered hyperspace (a dimension common to all the other ones, that binds them together) and permeated it absolutely, now being able to touch every dimension, even open pathways between or within them (thus being a conduit for faster-than-light travel), but not able to enter them. Also, as the mandate of the universe is to propagate life, or at least organic matter, peak of evolution is organic. This is why, for example, the Elder Things developed wings for interstellar travel instead of using mechanical aids. One more random idea for the end, all the magic is science as it often is, and is basically manipulation of dimensions predicted by the string theory to produce energy, manifest matter, etc. How that ties with chanting and rituals though I haven’t thought through. In the end, I’d very much like to see the extended version of your ideas someday. The Kickstarter failed, but I’d contribute again if you retry it, even if it doesn’t have any illustrations (thus aiming for a lower total sum). Thank you Marko. I appreciate your response and comments. Very interesting ideas!